It’s been almost three years since I last wrote about Jenna Adams, a former high school peer of mine who had been diagnosed with Acute Lymphoblastic Leukaemia (ALL) at just 18 years old. Since her treatment and recovery, Jenna’s new outlook on life has given her the inspiration to live to the fullest, and in August this year she’ll be celebrating reaching the five-year remission mile stone, where she is now technically classed as cured, with minimal chances of the cancer returning. Although she’s been working on keeping her health at the best it can be, there’s something more that Jenna is after – the chance to thank the man that saved her life. Having wanting to find her bone marrow donor for a while now, the five year mark is just a wonderful time to pursue that. Though, with only a few key details about her anonymous donor, she’s starting where information is shared best – social media. ‘It’s a gift that I can never repay and would love to say thank you! He literally saved my life,’ Jenna says. 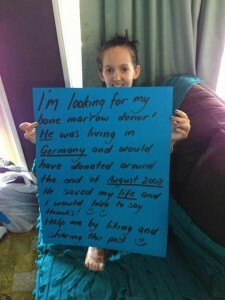 Her donor lives in Germany, is male and shares the same O negative blood type that Jenna has, donating his bone marrow at the end of August 2008. However, this is all the information that she has. Most of us have a Facebook, Twitter, Instagram or some other form of online social networking, and for only a few seconds of your time, we can help Jenna find the man who saved her life. Let’s share her photo with our friends and friends’ friends so that we can help get this message out. You never know who might know someone, and just a copy and click to share could mean the difference. If ‘every dollar helps towards finding a cure’, every share can help towards Jenna finding the mystery man that made every difference in her life. This entry was posted in Featured and tagged help jenna, leukaemia survivor, social networking. Bookmark the permalink.